Area Four Hits the Road! One of Kendall Square’s yummiest restaurants, Area Four (www.areafour.com), is taking the goodies on the road. Starting April 1st, Michael Leviton’s creation will join the food truck parade and feed hungry stomachs all across Boston at both breakfast and lunch with the A4 Truck. The truck will feed the masses homemade breakfast treats and breakfast sandwiches in the morning, before turning over to the lunch fare, featuring 4-5 daily piadinis – Italian-style flatbreads stuffed with meats and veggies – burgers, veggies and salads. As always, Area Four remains committed to featuring local farmers and seasonal ingredients. I, for one, am eagerly awaiting my first opportunity to eat a butternut squash, caramelized onions and ricotta piadini. My stomach is grumbling already. P.S. The truck is also available for hire at private events, making me a teensy bit sad to be hosting my wedding in Hawaii. I thought this was some weird event for a mass assembly of redheads. That creeped me out…too much pale skin, freckles, and the smell of SFP 70 for me to handle all at once. Fortunately for 99% of the world (no I’m not getting political) redheads will not host “Occupy Somerville” on January 28th. 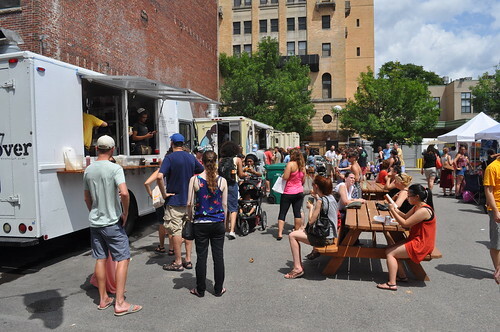 Instead, head to PA’s Lounge for Ginger [Root] Explosion #4 to sample some of Boston’s food trucks and Ginger Cocktails! Roxy’s Grilled Cheese, Staff Meal, Dosa N Curry, and Mei Mei will all be in attendance. This event will raise money for ArtsUnion, a cultural council designed to engage the public with Somerville’s artistic culture. ArtsUnion “produces events, markets, and cultural tours that show the cultural and artistic diversity of Union Square”. Side note/ Thank God: No redheads will be exploded at this event. Get Ready for a Food Fight, New York! Boston vs. NYC…the rivalry continues, this time with food. Head out to Dewey Square from 11-9 this Saturday for the First Annual food truck grudge match. Savory and Sweet Trucks representing each city will go head to head in various contests throughout the day for a chance to be crowned “Best Food Truck”. Boston’s trucks will include Bon Me, Kickass Cupcakes, Lobsta Love, The Cookie Monstah, Staff Meal, and Mei Mei Street Kitchen. The New York trucks are Bian Dang, Big D’s Grub, Fishing Shrimp, Mike N’ Wallies, The Munchie Mobile, Nuchas, and Waffels & Dinges. I am personally rooting for Bon Me. Their rice bowls are always fresh and fast with complex layers of flavor. The fresh cilantro coarsely chopped in all of their dishes really sells me. Try their “Thai Basil Iced Tea” and you will be rooting for them too!